PRODUCT DESCRIPTION: 32 oz jar which you must fill with water and dish detergent along with the single included lure. The lure is designed to alert female mosquitoes that a good egg laying location is near by. When detected by females ready to lay eggs, they will follow the smell to the source. When they enter the trap, instead of finding a good egg laying location, they will actually be entering a trap they cannot escape. Mosquitoes that tire and eventually land on the water will simply "fall through" the water's surface and drown. 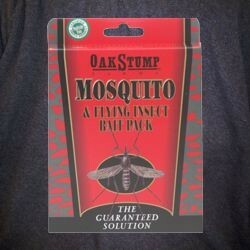 WHERE TO USE IT: Along property borders and in dark, damp and shady areas where mosquitoes are likely to reside when looking for a place to lay eggs. RATE OF APPLICATION: For every 5,000 sq/ft of yard, set out at least 2 traps. Most back yards will need 2-4 units. Set out 6 traps per 1/2 acre. Be sure to renew the Pheromone every month to get the best results possible and DON'T TOUCH THE LURE WITH YOUR HANDS WHEN LOADING IT INTO THE TRAP.